Today I went to my chiropractor, the fabric store, the grocery store, and drove through at Arby’s to pick up lunch. This probably doesn’t seem like much, but I’m recovering from some mild food poisoning and feeling a bit wiped out. 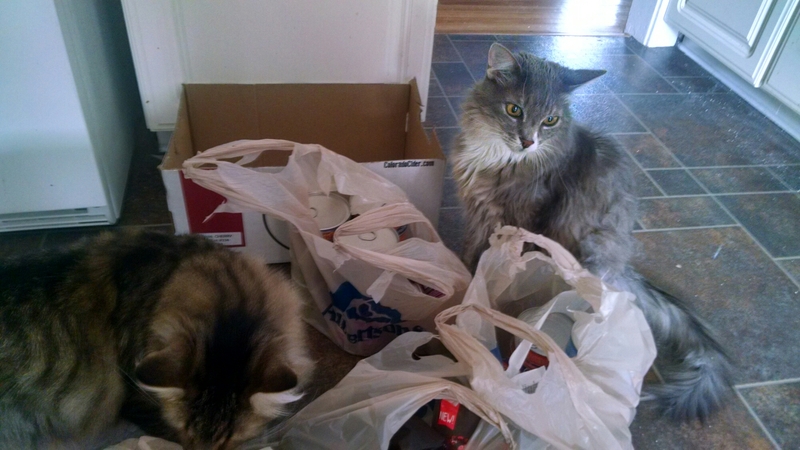 But the kittens were almost out of food. Note the relief on their faces. And the planning. What can will they open first? 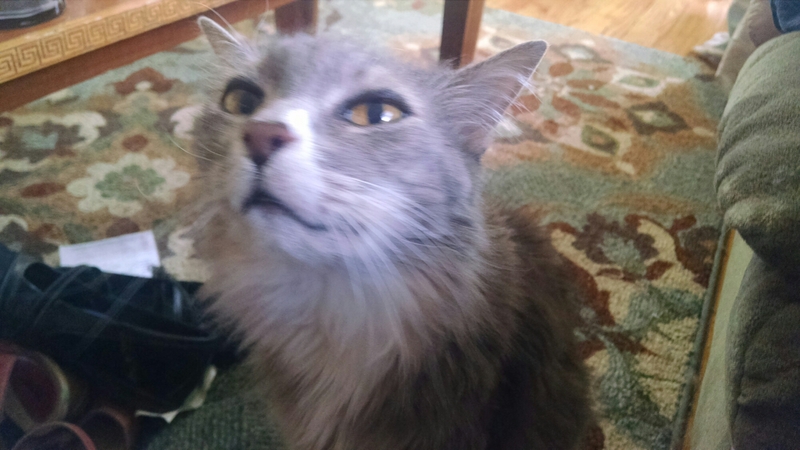 Side note: dear lady giving me the side eye in the grocery store for picking around the dented cans, have you ever opened a can of cat food completely filled with mold because you didn’t notice the dent had actually caused a hole? No? Then don’t judge me. Bonus: that can was in a box, so the mold had also spread around other cans, through the cardboard and onto my floor. My life for the win! Anyway, I got home and put away the refrigerated items. The rest is still on the floor in the kitchen. Oliver is administering Purr Therapy and trying to convince me he’s a good boy. I don’t know about that. 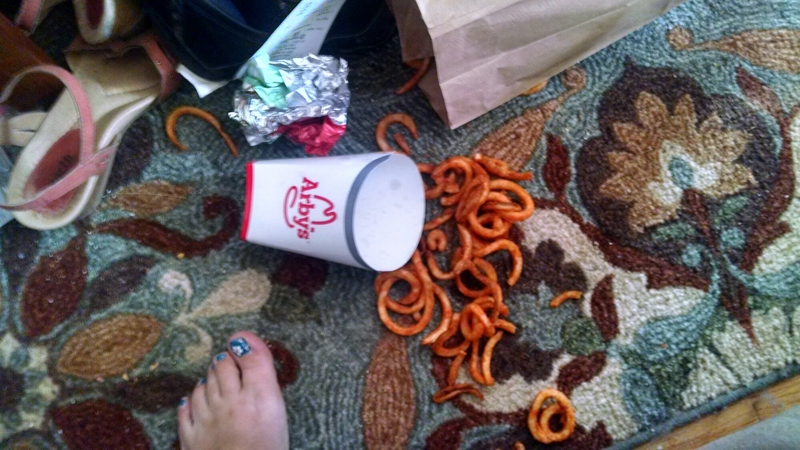 For one thing, I must have let Kitten Thunder’s manners out the back door when I came in with the Arby’s bag. Obi licked my sandwich wrapper, in my lap, while I was eating. Both of them bit my finger because I wasn’t putting down that roast beef fast enough (yes, Oli is allergic, but a tiny bit of roast beef is just one more zit on his already acne-ridden chin). That’s right. 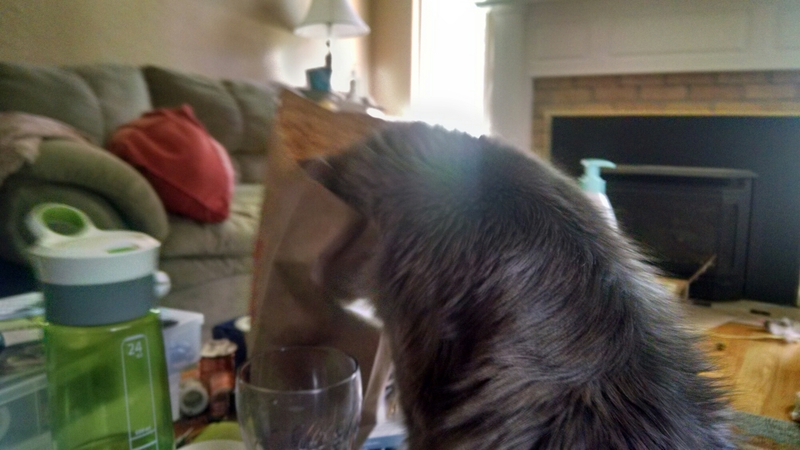 My tall grey kitten stood up and jammed his head into the bag and stole a curly fry. I was done with them, but kittens with bad manners don’t get rewarded for such behavior. 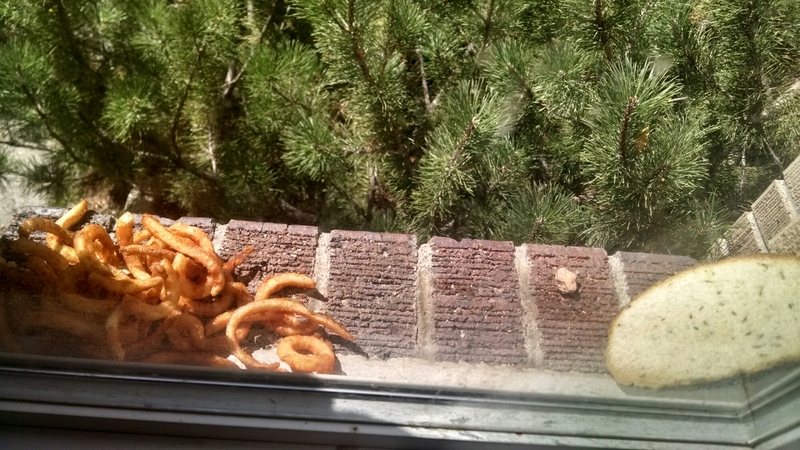 It’s a squirrel food battle between rye bread and curly fries. I’d pretend like I don’t know which will win, but I put out six slices of wheat bread at the same time as that slice of rye last night. They were gone for me to put out the fries today. From where I am on the couch I can see a squirrel hauling a chunk of fry up the tree. We’ve got a new program on OutTV. We’ve all placed bets on which the squirrels will like better: rye or wheat bread? Or graham crackers? In other news, Obi is mad at me for letting his pet wasp it off the house. He played with it all morning and it was still alive. This is a special trait for one of his pets. Unfortunately, his Girl doesn’t have the thick fur that surely was protecting him from stings – because this wall was NOT happy. And now the kitten is NOT happy. It has been about a year since I figured out that cranberries were the cause of a lot of the health issues I was having. This makes me sad because I love cranberries. If I could, I’d eat them in everything. I DID eat them in everything: cranberry pork, cranberry oatmeal, cranberry trail mix, washed down with some cranberry juice. A bag of opened trail mix with cranberries has been sitting on our counter in the kitchen for a year and a half. 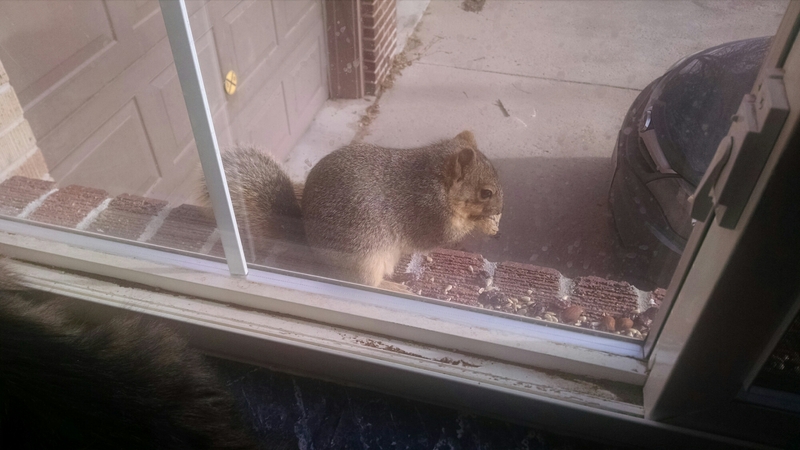 This week, I decided to feed it to the squirrels and birds. Obi hates when I decide to store food outside on the window sill! Whenever the squirrel jumped up onto the roof of the garage, Obi would lunge at the window so hard he was working the shelf away from the wall. I moved the director’s chair, where Oliver sleeps when I’m working, up against the shelf. Obi does not approve either. 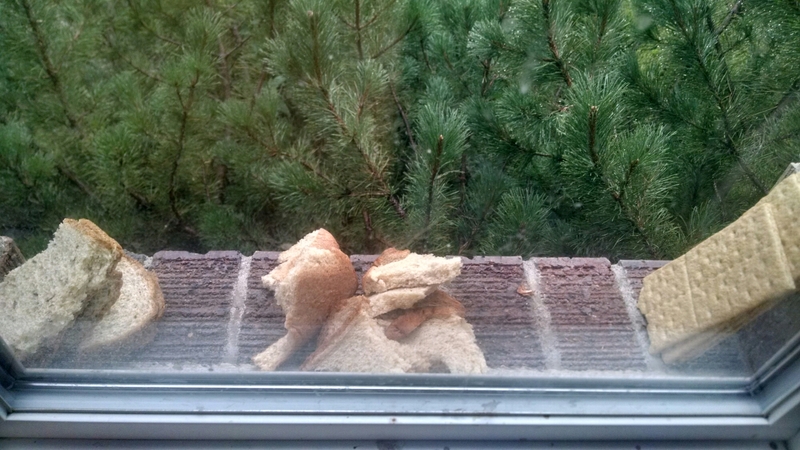 As you know, I put our leftover bread on the window sills to attract OutTV programming for Kitten Thunder. The one bad thing about bread during the spring, though, is that squirrels tend to take their meals and run. I’ve always assumed they were taking it home to their kittens. This week, at least, I was wrong. Obi and I were in the breakfast nook, watching a squirrel hang upside down from a branch to eat seeds out of the bird feeder. The birds were landing, looking ticked off, then noticing the copious amount of seed on the ground then would shrug and chow down. Since I had bread to give…I gave. “Would you like some bread?” I asked the squirrel. He was hanging upside down still, looking worried that he was going to have to get away. But I tore up some bread and left it on the porch for him. Inside, Obi and I watched. The squirrel approached the bread. He grabbed two pieces, jammed them into his mouth, and climbed up the side of the house onto the roof out of sight. Obi and I made eye contact. We did not approve. 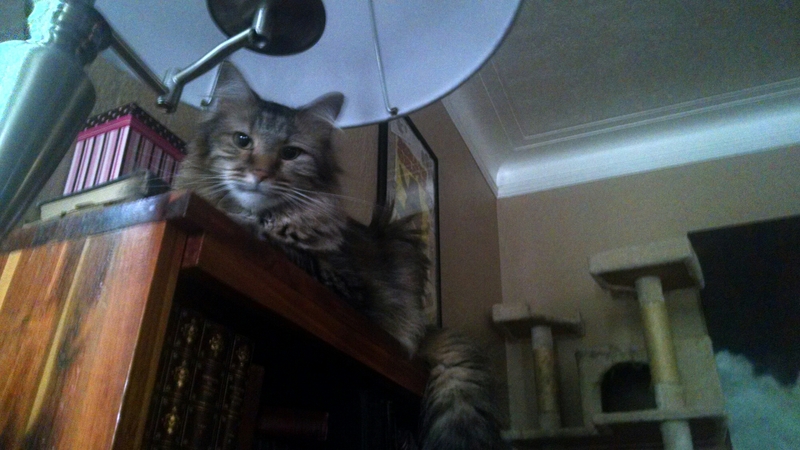 A while later, I was straightening the cat shelf blankets up in the reading nook and talking to Oliver. I heard the pitter patter of feet on the roof. They pittered up one side and pattered down the other. Outside, the squirrel came into view with a mouth full of bread. He ran to the end of the garage and hopped into a tree. And there…he ate the bread. Then he went back to the porch. Then he came back to the tree. And I heard the pitter patter of bigger feet. Obi was on to this special OutTV program. He came running up the stairs and flew up to the cat shelf. 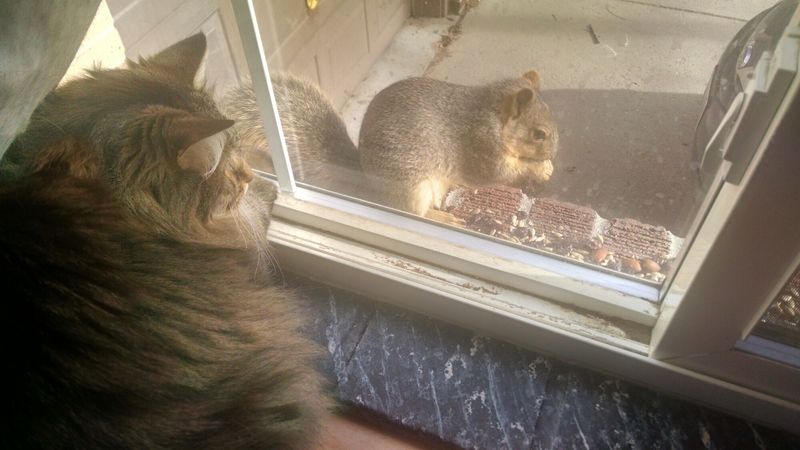 When the squirrel returned to the porch, the brown kitten tore down to the dining room to watch. In actual television news this week, The Boy and I decided to get rid of cable and start streaming our screen entertainment. 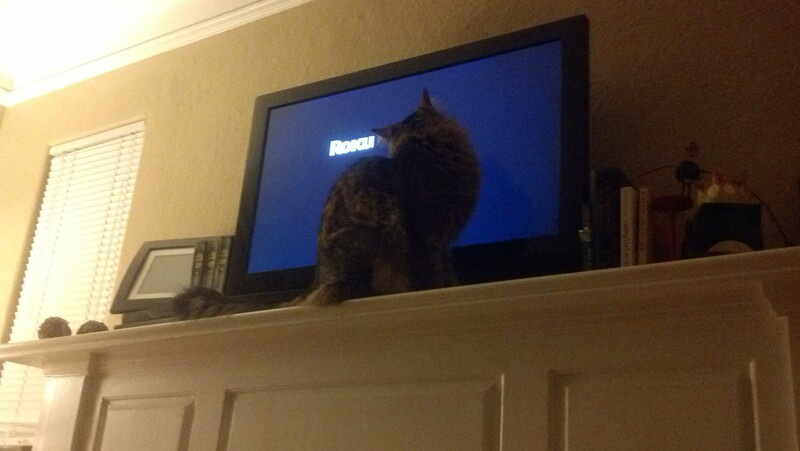 I hear there are special channels for cats. The screen saver seems to work for now. It was state hockey weekend again and that meant lots of visitors for Kitten Thunder. My parents, along with Cousin Jigger, stayed at our house. And, since my nephew’s games were at way-too-early a.m., my niece also stayed with us. The biggest issue Oliver and Obi has is that Lexi didn’t bring Barbi with her. What good is a little girl without a doll? So she bought one on Saturday – both cats helped get her out of the packaging and tried out her hands for chin scritching. Meanwhile, on the dog front, things went a little more smoothly. No one got punched in the nose. Kitten Thunder spent most of their time in the living room with us…watching. It started out a little tense. But as the weekend went by, everyone calmed down. Then, everyone discovered they have an interest in common. Who doesn’t like squirrel watching? 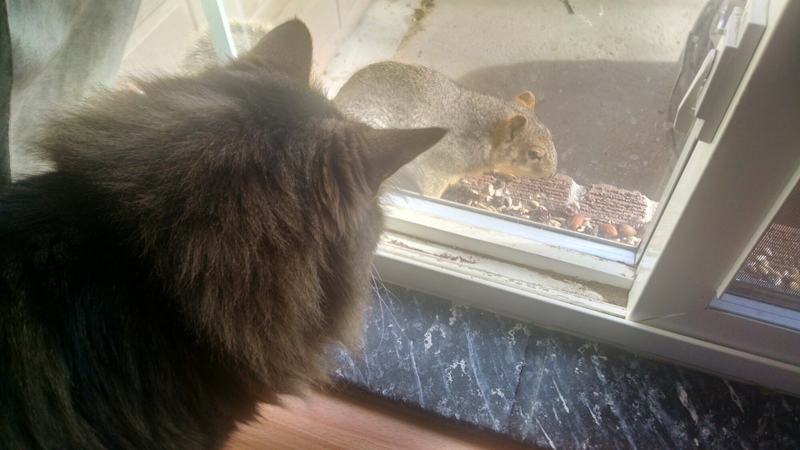 An hour after everyone left yesterday, the squirrel came to the window sill and looked in at me on the couch. He wanted to know where his audience was. This morning, I was glad that the audience was gone: spring has arrived an OutTV is a tiny bit pornographic. I’m thinking about piping mood music out to the front porch. Not that they seem to need music. The Boy and I don’t eat the same kind of bread. Being the only people in our house, we hardly ever finish a loaf of bread before it gets stale or molds or I just buy another loaf because I forgot to see what we had before I went to the store. This leads to a lot of extra bread. The same happens with tortillas, though not as often. When it was -20 degrees, I wasn’t putting out food because squirrels aren’t crazy. That is the exact type of weather that they store nuts or whatever for. So we had a surplus. A giant stacks of the ends of breads and tortilla dregs. I did what anyone would do in this circumstance: I set up a taste test. The results: Squirrels prefer rye bread over tortillas. But they’ll eat them both. Next week we’ll be testing to see if they like my wheat bread over rye. Seriously…who wouldn’t? Oliver has a bag. This is his new favorite place to lay and a spot for which he has forsaken the post-breakfast snuggle. Once in a while Obi comes in to remind him that Tail knocked the bag off the coffee table, so Tail’s attached kitten should be allowed to lay on the bag. 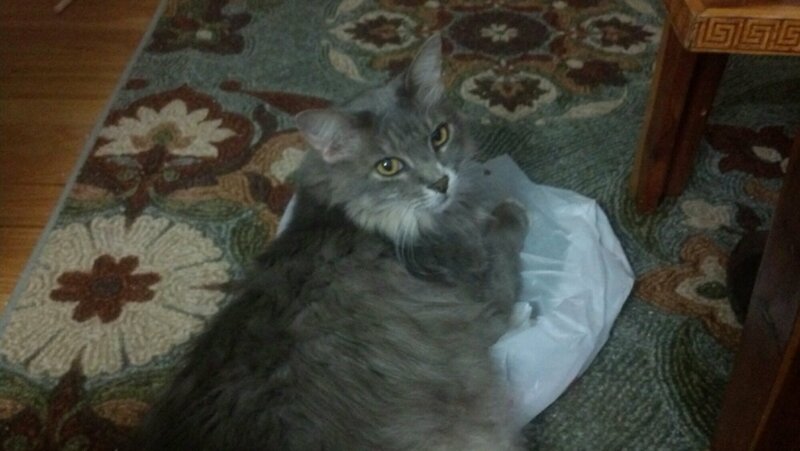 The grey kitten sees the reason in this…but he doesn’t get off the bag. This week, we have two new programs on OutTV. First off, there is a little black kitteh wandering around. He looks pretty healthy so he obviously belongs to someone. But he is claiming a lot of territory in the neighborhood. Yesterday, Black Kitteh had a squirrel up a light post. The squirrel was hanging out about ten feet off the ground, trash talking the kitten. Eventually the kitten gave up and walked away. Except he didn’t give up. He hid around the corner and waited for the squirrel to come down. Unfortunately for him, the squirrel (and I) was not fooled. The squirrel came down the pole and crossed the street to our house. Obi and I watched as Black Kitteh chased the squirrel from one channel of OutTV to the next and the next until they were on the Jeff Channel. Obi doesn’t go outside but he did not want another kitten in his Out. The more exciting programming is a sharp-shinned hawk that has moved into the neighborhood. She is very talkative and, though we hardly see her, we hear her cry all the time. Yesterday, Obi was napping on the back of the couch while I worked. He was enjoying some Smell-O-Vision from the Jeff Channel and he was stretched out very flat. As flat, I thought, as he could get. Until the hawk swooped down between our house and Jeff’s house and screamed just outside our window. She was so close I could hear her wings. The hair stood on the back of my neck. And the cat? Got flatter.